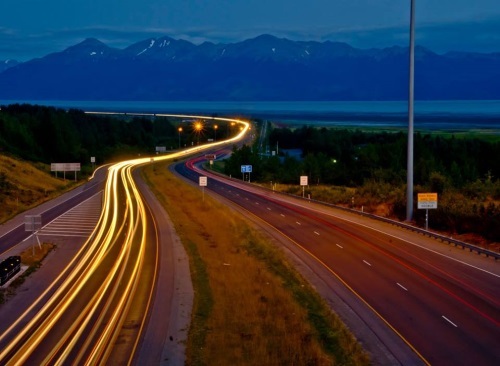 A pilot program launched nearly two years ago to help reduce highway lighting costs is saving money for the Alaska Department of Transportation & Public Facilities. The agency said in a statement on April 8 that electricity is a “significant part” of its central region operating budget, costing $2.2 million annually for approximately 8,500 highway lighting fixtures, adding that late night and early morning hours account for 50 percent of the department’s electrical budget for lighting – times when less than 5 percent of the traffic is on the road. Because of the continued need to save operating costs, the Alaska DOT&PF plans to expand its “lighting curfew” to additional sections of state roads and highways, with estimated savings from this effort to top $190,000. The Alaska DOT&PF is also converting eligible roadways to light-emitting diode or “LED” lighting with federal funds as repair cycles occur. Future LED Lighting Retrofit Projects along the Glenn Highway from the Seward Meridian Highway to Lucas Road could generate another $33,000 in annual savings, the agency noted. Overall, combined LED retrofits and lighting curfews could potentially to reduce highway lighting system costs by up to 75 percent compared to the cost of the existing system. State DOTs in different parts of the country are using a variety of strategies to reduce highway lighting costs. For example, the Illinois Department of Transportation issued a formal request for information in August last year to private sector firms interested in working with the state to replace its aging highway lighting infrastructure with more energy-efficient equipment via a public-private partnership or P3 program. The Michigan DOT entered into just such a P3 program for highway lighting systems P3 four years ago; a program considered to be “the first” P3 dedicated to freeway lighting replacement. That plan aims to replace 87 percent of Michigan’s 15,000 freeway lights in the metro area with LEDs.